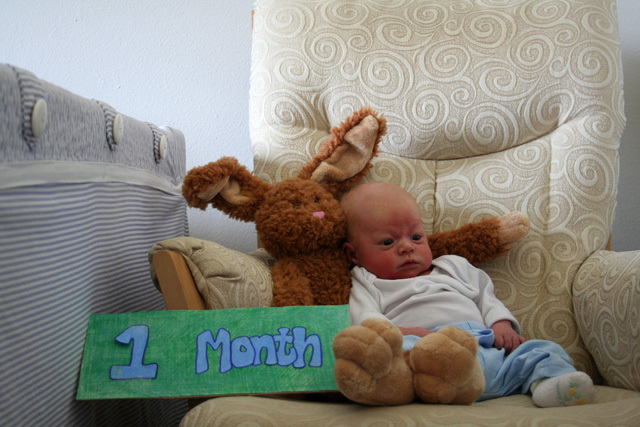 Mile High Baby: Peter Ambrose is One Month Old! Happy One Month Birthday, Peter Ambrose!!! It’s hard for me to believe that just over a month ago, Rick and I had not yet met our sweet little son, who has quite literally turned our world upside down. On March 12th, 1:32 PM, our lives suddenly revolved around feeding, pooping, sleeping … not sleeping … and of course, extraordinary love. Never a dull moment! Our sweet little son is truly a treasure. He has a mellow temperament, with a watchful eye – he spends much of his awake time just observing his surroundings, taking the world in. Watching PA’s movements and facial expressions has replaced other forms of entertainment, and nothing is more delicious than holding him at our chest while he sleeps. In some ways, we’ve had it remarkably easy – Peter Ambrose seldom cries. We have yet to have a crying fit that hasn’t been quickly resolved by food, sleep, or affection. In other ways, this month has been very challenging (see the previous blog entry). But most of it is par for the new-parent course. A few of our friends who are also parents have remarked how amazing it is that something so little can take up so much time, space, and laundry – and we’ve found it to be quite true! You start your day at 6:00 am, and before you know it, it’s 2:00 pm, you’ve gotten nothing done that didn’t have something to do with Baby. I look around my living room, and I see couch cushions pulled out of place, diapers on the floor, baby blankets and burp cloths dispersed in every corner of the house… Messiness, intermingled with an air of sleep deprivation, the work of deciphering our little guy’s cries and cues, handling diaper blow-outs… these are all evidence of the growing life-force that is our little guy. But locking eyes with our son, or catching one of those elusive grins flash across his face … those moments are worth every hardship and inconvenience. We love you Peter Ambrose! And we can’t wait for the next phase of your life, whatever it should look like.